Yes, the title of this post is a little bizarre. When you take up the bizarre task of responding to Bill Maher (half comedian, half political commentator, all theophobe), you often end up in this wacky territory. You see, Bill Maher is not someone to take seriously, and taking him seriously often brings with it the nagging feeling that you’re being duped, sort of like being really hospitable to Borat. But you also can’t ignore this guy either, because, believe it or not, he has an audience, an influence, and a misbegotten idea that when it comes to Mormons, he knows what he’s talking about. Well, he doesn’t. Let’s repeat that: Bill Maher doesn’t know anything about Mormons. For example, he says that all of Mitt Romney’s significant charitable donations to the LDS Church (we’re sugarcoating: the word used was “cult”) are meaningless, since the LDS Church doesn’t help anyone poor with its money. Yet sophisticated research (i.e., the top link on a basic Google search) reveals that the LDS Church operates 141 welfare food storehouses and 322 employment resource centers and supports 8,167 welfare missionaries (i.e., volunteers working in purely charitable endeavors), and since 1985 has assisted in 198 global disaster relief efforts, donated cash and material supplies valued over a billion dollars, and distributed 10.3 million hygiene, newborn, and school kits. So either Bill Maher doesn’t know what he’s talking about, or he just counts newborn babies in developing countries as undeserving of serious aid, along with Cornell. But that’s all just preface. In the Overtime portion of his show this weekend, Maher had some new comments about Mormons, including the notion that Mormons teach that Jesus is American. Again with the American exceptionalism. Let’s try and summarize what is true and false about this notion. It is true that the LDS Church was established on American soil, that Mormon scripture ascribes a blessedness to this land, and that Mormons generally believe the nation’s founding was guided by providence to establish a place of religious freedom where God could restore his church. In fact, Mormons believe that the Book of Mormon, a foundational Mormon scripture, relates events that took place somewhere on North or South America. The Book of Mormon tells one story in which the resurrected Christ appeared to an ancient nation of people living in this hemisphere, and instructed and healed them over the course of a few days. Taken together, these ideas have percolated within Mormon culture to create a deeply-felt patriotism that is probably above average among religious communities. Mormons believe that America is great, was born out of inspiration, and has played host to some important events. Do Mormons teach that Jesus was American? No. The Book of Mormon story is quite consistent with the biography of the Christ as set forth in the New Testament. Jesus was born in Bethlehem, grew up in Nazareth, and ministered throughout Palestine before his death. His short visit to the people of the Book of Mormon, after his resurrection, doesn’t make Jesus an American any more than a visit to the library would make Bill Maher open-minded. You will never find a Mormon claiming that Jesus was an American, nor have I ever heard such an idea taught in an LDS setting. I also don’t see any connection between believing that America has played a great role in sacred events and believing that America should dominate all the other nations of the world, but that will have to wait for another post. Lastly, Bill Maher says that Jesus was at least “sincere,” in contrast to Joseph Smith, who was an obvious “con man.” The con man line is difficult to discuss without delving into significant historical detail (though it is indeed false). However, here’s one good shorthand test for figuring out whether a self-described prophet is really just a con man: set out to kill him. Typically, a con man will abandon his message rather than die for it. Joseph Smith never did that– he was killed for his message, and stood by it until the very end. He was imprisoned by his enemies numerous times, and was persecuted all of his life, without ever a hint that he might be ready to back off his story. It’s not a great life for a scam artist. Whether one believes Joseph Smith’s message or not, a knowledge of his life and times is at least sufficient to reveal that the man’s efforts were sincere. The jury’s still out on Bill Maher though. A smarter discussion, including ideas of Mormons’ attachment to America, took place over the weekend on Melissa Harris-Perry’s MSNBC show, which you can watch here. I commend and thank you guys for taking the time to listen to people like Bill Maher and refute what they say because I just can’t. I’m looking forward to more of your stuff (I’m really glad to have found this blog – I think Glenn Reynolds is the one I have to thank for that). Keep up the good work. It’s nice to see a blog written specifically about and by Mormons that is interesting to me as a Mormon but also explains things for the non-Mormon crowd. The William Blake poem was inspired by the apocryphal story that a young Jesus, accompanied by his uncle Joseph of Arimathea, travelled to the area that is now England and visited Glastonbury during Jesus’ lost years. The legend is linked to an idea in the Book of Revelation (3:12 and 21:2) describing a Second Coming, wherein Jesus establishes a new Jerusalem. The Christian Church in general, and the English Church in particular, used Jerusalem as a metaphor for Heaven, a place of universal love and peace. Mormon Doctrine seems similarly based on such beliefs. Excellent article Ryan. It’s funny though…the more people like Bill Maher bash the Church…the more it reinforces my testimony of it’s truthfulness. I also appreciate your taking on Bill Maher–we know there were characters like him in the Book of Mormon and remember their fate. In the same way, I don’t think any reasonable Christian would claim that Israel should dominate all the other nations of the world. 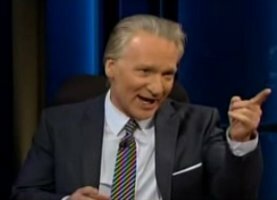 Maher gave an interview in which he said “Americans are stupid, Mormonism is a stupid religion, so Americans will become Mormons.” I think that reveals Maher’s real anxiety that motivates his attacks: He is afraid of the Mormons, of our success, and especially our growing numbers and influence in society. People don’t get mad at groups that are shrinking. I think that, along with other left wing talking heads, Maher has seen the projections of Mormons doubling every 20 years, to nearly 50 million by 2050, and 100 million by 2100, and the vision of Mormons having major influence in elections scares him badly. Those numbers are just in the US. Worldwide membership would be twice that. Of course, that raises the question, if people become Mormons because the people are already stupid, and people around the world are joining the Mormons, then according to Maher’s theory, ALL the nations of the world are just as stupid as Americans. In other words, Bill Maher thinks he is smarter than everyone else on earth. You will recall that in the Book of Moses, God tells Moses that He has the greatest intelligence of all. I once heard distinguished chemistry professor Henry Eyring state that you could define God as the smartest person in the universe. Apparently Maher aspires to that position. However, since he is manifestly not the holder of that position, he is defecting to the party of Lucifer, who thought they were smarter than God. @coltakashi – That was an amazing post. From now on, every time I see Bill Maher in the media, all I am going to remember is your post revealing Maher’s “defecting to the party of Lucifer” as he seeks to become smarter than God. Toast to you, coltakashi. I’d be interested to hear a Mormon take on the history of Joseph Smith and the early LDS. I admit that my only exposure is some reading of the book of Mormon and Jonathan Krakauer’s book “Under the Banner of Heaven”, which started by examining fundamentalists and seemed to follow a fairly anti-Mormon route throughout. Maybe that’s just how the facts lie. Maybe the whole seer stone and lost tablets situation is no less believable than earlier revelations, just more recent. Maybe Krakauer’s descriptions of teenage marriages and polygamy is taken out of historical context somehow. Either way, I’ve been enjoying the blog and would love to see how you approach the historical angle of anti-mormon criticism, as most of the “leaving the church” accounts I’ve read have at least touched on history as a reason for the initial doubt in the church’s teachings.